Ten years ago, when an untitled painting of a gun-toting toddler won the top purchase award in the Evansville Museum's Mid-States Art Exhibition, people found it's subject matter disturbing in an enigmatic sort of way. When Museum Director John Streetman stumbled across the painting in storage the day after children murdered children at a Jonesboro, AR., middle school, Dan Addington's untitled painting, identified only as "Boy with Gun" had taken on new meaning. "Now the visual metaphor seems so obvious, but 10 years ago these things simply weren't happening," said Streetman, who has had the painting rehung in the museum's second floor" Of Face and Form Gallery." "The painting originally hung for six weeks and was quite controversial with visitors, who were disturbed by it but did not understand it. 'What's that baby doing with a gun?' What's frightening - even prophetic - is that child wearing Dr. Denton pajamas would be almost exactly the age of those boys in Arkansas." Ten years ago, people also were perplexed by the strange red light reflected across the child's face, Streetman said. "Now it seems so obvious that it's a television screen", he said. "Suddenly, it just leapt out at me. This is really what art is all about - one of those moments when art suddenly does actually mirror life. We talk about art being a mirror of life. This one was prophetic. It was as if the artist were seeing into the future." 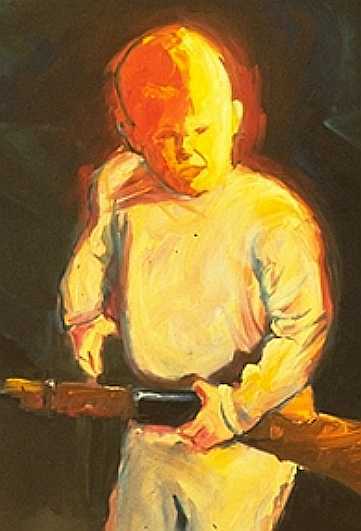 The portrait of the baby with a gun re-surfaced the same week that the cover of Time Magazine featured an old photo of a 3-year-old boy from Jonesboro with a shotgun slung over his shoulder. However, if the artist were seeing into the future, even he wasn't aware of it at the time. "The painting is actually a painting of me - painted from a photograph my dad shot in the early '60's," Addington, now director of the Gwenda Jay Gallery in Chicago, said in a telephone interview. Addington - who was a master of fine arts degree candidate at Illinois State University when his oil painting won the $3,000 purchase award in the museum's 41st annual Mid-states competition - had done a whole series of works based on images from black and white family photographs. He was about 3 years old in the photograph on which "Untitled (Boy with Gun)" was based, and the gun was a toy, he said. "Back then, toys were made like real guns, " said Addington, whose original artist's statement described his work as addressing such issues as "relationships, influences, innocence and its loss." "It is my hope that through examining our past we might more clearly see our present and possible future, " he wrote. When he painted the boy with a gun, however, he said it "wasn't supposed to necessarily be a criticism" but "something that raises questions and doesn't answer them." He himself is proof that not every boy with a gun evolves into a killer, he said. "I grew up in the Midwest, in Iowa and Colorado. My dad was not an avid hunter, but I went pheasant hunting and squirrel hunting and fishing with him, and he taught me respect for guns. That was in junior high and high school, however. I was not an 8-year-old or a 10-year-old running around with a gun. There was always supervision, and it wasn't a huge part of our life - just one more diversion in an otherwise full life." The last time the 35-year-old artist (who won marksmanship medals as a Boy Scout) shot a gun was in college when a group of art students went to a shooting range on a lark. "I was the only one in the whole group who had ever shot a gun before",he said. Addington said he didn't think of the light as a television screen until the painting was nearly completed. "Sometimes the painting itself suggests things to you. It does for me, at least. If I paint in an open and honest way, the painting starts talking back to me. If you're too much of a director, you're just illustrating. The child's glowing face was really influenced by the Old Masters I was studying at the time. There is just as much Rembrandt as television in that." A few days before Streetman called the artist to tell him his painting was being rehung, Addington had been pulling some of his earlier work out of storage at his studio to show to a friend. He came across two other paintings from the "children with guns" series and the original drawing on which the museum painting was based. "My friend said, 'This work is really disturbing in light of current events, isn't it?' "said Addington, who said he hadn't thought about "Boy With Gun" "in ages", not even in the glaring light of Jonesboro. "No work of art is really completed until it's viewed. Art should be open and ambiguous enough so that viewers can approach it and apply the circumstances of their own life and come up with an interpretation that relates to them. While I didn't know when I painted this that two kids in Arkansas would one day go on a rampage, I hoped that the painting went beyond an illustration of personal history. I wanted it to be universal - at least within the context of American life." When Addington later told a former professor about Streetman's call, the professor reminded him of "the most ironic part of the whole story" - that he had started the "Boy with Gun" series when he was working on his master of arts degree at Arkansas State University. "I did the first drawing for that painting in Jonesboro"'Addington said. 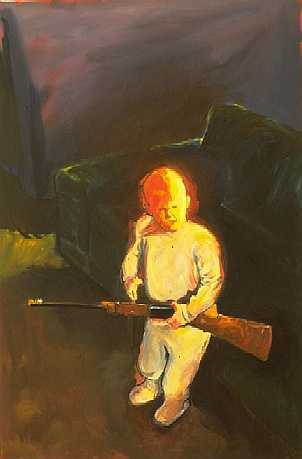 Pictured top: "Boy With Gun", 1988, oil on canvas, 72"x 54". Pictured above: "Boy with Gun, detail.